WASHINGTON, D.C. -- Fifty percent of Americans believe the U.S. and Russia are currently heading back toward a Cold War. During his trip to Europe, President Barack Obama acknowledged increasing tension with Russia but said he has no interest in entering into another Cold War. 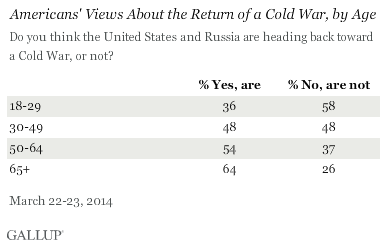 Spurred by increased international apprehensions of Russia's annexation of Crimea, Gallup asked Americans on March 22-23 if they felt the U.S. was returning to a Cold War. 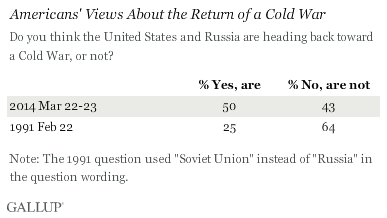 Gallup asked the same question in February 1991 polling and found a quarter of Americans saying they thought the U.S. and the Soviet Union were heading back toward a Cold War, while 64% did not think this. The 1991 polling took place as tensions were easing in the decades-long Cold War, prior to the breakup of the Soviet Union at the end of that year. In January and February 1991, the U.S. Congress voiced anger over Soviet crackdowns on independence fighters in the Baltic region. Older Americans are much more likely than younger Americans to say the U.S. and Russia are heading back toward a Cold War. 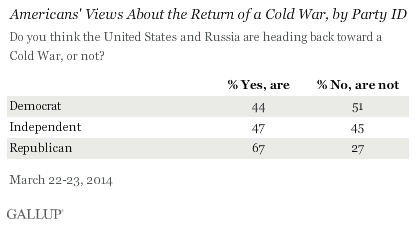 Sixty-four percent of Americans aged 65 and older say a Cold War is returning, almost 30 percentage points higher than the percentage of 18- to 29-year-olds who hold this same view. This difference in opinions between ages could be linked to Americans' experiences with the Cold War. The oldest Americans in the 18- to 29-year-old age group would have been five years old when one of the death knells of the Cold War occurred -- the falling of the Berlin Wall in 1989. Overall, many in this younger age group were not alive at all during the Cold War. Americans who are older than 65, however, were at least 40 as the Cold War ended, and they grew up when tensions between the U.S. and Soviet Union dominated American foreign policy. Americans of different ages are also paying different levels of attention to the situation in Ukraine. Nearly 80% of Americans aged 65 and older are very or somewhat closely following the news about the situation between Russia and Ukraine, while 42% of Americans aged 18 to 29 report paying the same amount of attention. Nearly 60% of Americans who are very or somewhat closely following the situation between Russia and Ukraine say the U.S. is heading back toward a Cold War, while 36% of those whose who are not closely following the conflict say the same. Fewer than half of Democrats and independents feel the U.S. is heading back toward a Cold War, compared with more than two-thirds of Republicans who say the same. These party differences could be linked to the finding that U.S. seniors are more likely to be Republican. They also may be associated with Republicans' historic views of the importance of the U.S. military and support for defense spending. The Cold War, from roughly 1945 to 1991, was a watershed moment in American history. This period redefined America's defense system and led to decisions to enter into military conflicts in Korea and Vietnam. While the U.S. and the Soviet Union never directly engaged in battle, this competition led to an unprecedented arms race between the two nations. The icy tensions between the U.S. and the former Soviet Union affected countries worldwide for decades. Russia's recent annexation of part of Ukraine as well as its support for Iran and Syria have put it at odds with the U.S. During his visit to Europe, President Obama said he does not feel the U.S. is returning to the Cold War, but currently, at least half of Americans do not appear to agree with him. Even if U.S.-Russia tensions do not escalate to the point they did during the Cold War era, for the immediate future, Russia may be the most challenging foreign policy issue facing the U.S. Results for this Gallup poll are based on telephone interviews conducted March 22-23, 2014, with a random sample of 1,012 adults, aged 18 and older, living in all 50 U.S. states and the District of Columbia.